What is the different between looking and seeing? This piece asks this question as the literal perspective of a viewer radically changes how the work is seen. 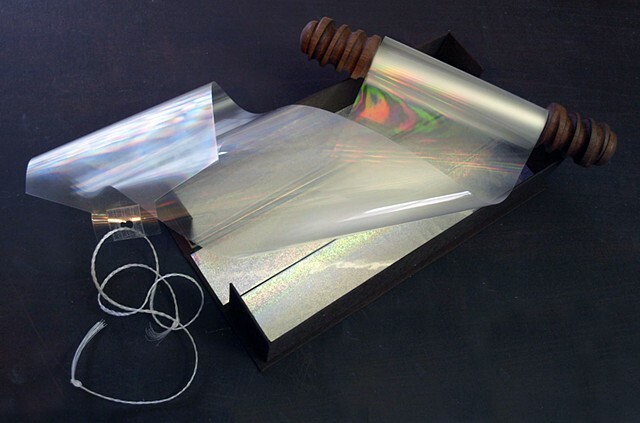 At one point the scroll looks like a simple piece of plastic on a wooden dowel, at another it casts rainbows over anything in the viewer's line of sight. Named in homage to Carolee Schneeman's 1975 piece of the same name. Of her piece, Schneeman says the piece is meant to, "...physicalize the invisible, marginalized, and deeply suppressed..."
Special thanks to Jim Greenwell for technical help in completion of this project.